Gather Kwanzaa party supplies to create the right atmosphere for the celebration. Kwanzaa, an African harvest feast started by Dr. Karenga in the mid-twentieth century, is celebrated at the end of December. 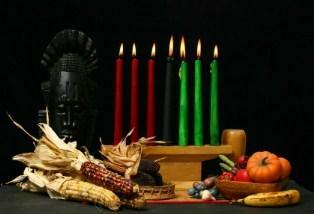 Learn more about the history of Kwanzaa in order to choose the proper supplies for your party. A large portion of party supplies is for decorating your home. These party supplies can be made or you can purchase them through party supply stores online and locally. Kwanzaa is a seven day celebration, so consider adding decorations to your home on each day, representing the meaning of that day. The many symbols that help define what Kwanzaa is are excellent additions to any party supply list for Kwanzaa. Use these symbols as part of a table centerpiece decoration, mantel decoration or throughout your home. Harvest Symbols: Wheat, gourds and other fall harvest bounty are the perfect choice for using as decorations throughout the party space. Consider looking up African crops and including them in the décor as well. Corn is especially important in the celebration, so be sure to include several ears in the display. Straw Mats: Use a small straw mat in lieu of a typical table runner. Some can also be hung, similar to tapestries. Alternatively, use straw mats as place mats for everyone at the feast table. Candles: The Kinara is an important candle decoration during Kwanzaa. It consists of three red and three green candles, with a black one in the center. Each candle is lit for a unique purpose. The Kinara is typically a highlighted decoration in the celebration. Unity Cup: Place the unity cup near the Kinara or with other harvest bounty in your home décor. You can use the same cup for the feast or a different one. By using symbols from the Kwanzaa celebration for decorations, your home will have a festive feel. Hosts who are inviting guests that are unfamiliar with Kwanzaa or African history may want to put out short information cards next to items that have special significance to the hosts or within African culture. Keep the explanations short, within five sentences or so, so guests do not feel like they are in a museum rather than at a party. Like other holiday parties, a Kwanzaa party needs to have general supplies to keep it running smoothly. Purchase tablecloths, plastic table settings and chair covers in the Kwanzaa colors of red, green and black. Streamers and wall hangings can also incorporate the colors of the holiday. Parties that will have a program or the Karamu feast might need a printed program so that guests can follow along with the festivities. Kwanzaa is a relatively new celebration that may need more explanation for those who want to follow along. Print the various activities on a small 4 x 6 card that has Kwanzaa clipart and graphics. Hand it out at the beginning of the party or place it on everyone's plate at the dinner table. Finally, remember to have a camera charged and plenty of space available on your memory stick. Photographs are an excellent way to preserve the wonderful memories made with family and friends as you celebrate Kwanzaa. Kwanzaa party supplies turn a simple holiday gathering into a large celebration. A festive, decorated atmosphere sets the right mood for a Kwanzaa party.